The New York Times in its “Room for Debate” feature invites knowledgeable outside contributors to discuss news events and other timely issues. The feature also solicits comments on the topic from readers. 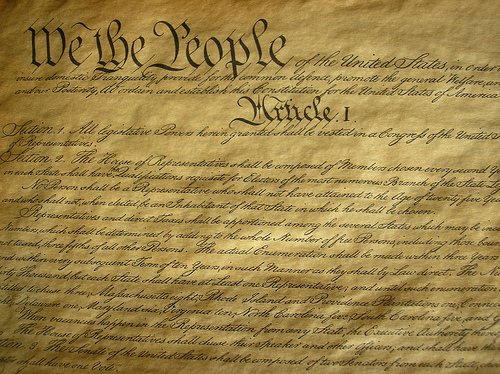 The feature’s July 9th topic is suggestions for amending the U.S. Constitution. Ten professors of history and law started the conversation with their suggested constitutional changes. Direct Election of President. Article II, Section 2 provides for election of the president by an electoral college. Alexander Keyssar, the Stirling professor of history and social policy at Harvard’s Kennedy School, suggests abolishing the electoral college and having the president (and vice president) directly elected by the national popular vote. He says the “concerns that prompted the Founding Fathers to adopt [the current] . . . system — a distrust of popular elections, worry that the people would be unfamiliar with national candidates, a desire to reinforce the great constitutional compromises between large states and small states, slave states and free states” are no longer valid. As indicated below, I support this proposal. Qualifications for Office of President. The Constitution’s Article II, Section 4 establishes the following qualifications for the presidency: “a natural born citizen,” at least 35 years old and a resident of the U.S. for at least 14 years. Akhil Reed Amar, a professor of law and political science at Yale University, proposes this be changed to make eligible “those American citizens who happen to have been born abroad to non-American parents — and who later choose to become ‘naturalized’ American citizens.” This would be consistent with the overall historical trend of increasing equality and with the current practice in the 50 states. I am indifferent on this proposal. Federal Judges Tenure. The Constitution in Article III, Section 1 now provides that federal judges hold office during “good behavior,” which in practice has meant for life absent voluntary retirement. Jamal Greene, a professor of law at Columbia Law School and a former clerk for U.S. Supreme Court Associate Justice John Paul Stevens, says “In a democracy, no one person should wield so much power for so long.” To solve this problem, Greene endorses a proposal by Professors Steven Calabresi and James Lindgren for Supreme Court appointments with non-renewable 18-years terms, with one new justice every odd-numbered year. Re-emphasize that Treaties Are Part of the Supreme Law of the Land. Under Article VI, Section 2 of the Constitution, “all treaties made, or which shall be made, under the authority of the United States, shall be [part of] the supreme law of the land, and the Judges in every State shall be bound thereby, anything in the Constitution of laws of any State to the contrary notwithstanding.” However, as pointed out by Jenny S. Martinez, the Warren Christopher professor in the practice of international law and diplomacy at Stanford Law School, the U.S. Supreme Court has held that certain treaties were not enforceable against the states. Therefore, she suggests that this provision be re-emphasized in some way. I agree that treaties under the existing Constitution are part of the supreme law of the land and that they should bind states. There, however, is no specific proposed amendment to react to. Rappaport has a valid objection to the present constitutional scheme, and I could accept a proposal that would allow three-fourths of the states to propose specific amendments, but would still require a two-thirds vote by each house of the Congress to adopt an amendment. She believes that the existing Constitution is sufficient on this point so long as it is followed by the courts, but is open to amendment to restore certain powers to the state and like Michael Rappaport endorses the suggestion that the states have the right to propose federal constitutional amendments. Although as just stated, I support giving the states a right to propose specific amendments, I do not favor any amendments that seek to diminish the power of the federal government. In this age of globalization, it is unwise to emphasize states over the federal government. Narrow Congress’ Power Over Interstate Commerce Power. As discussed in prior posts before and after the June 28, 2012, Supreme Court decision regarding the Affordable Care Act, the power of Congress under Article I, Section 8(3) to “regulate commerce . . . among the several States” has been interpreted by the Court to encompass intrastate commerce that has a substantial effect on interstate commerce. I oppose this suggestion for the reasons stated in my prior posts. This wording, like most of the first eight amendments, Msier believes, affirms basic rights in general terms, not as restrictions on the federal government. It also would undermine the Supreme Court’s decision about corporate speech in the Citizens United case. I support this proposed amendment. Delete the Second Amendment’s Right To Bear Arms. The Second Amendment to the Constitution provides that “the right of the people to keep and bear arms, shall not be infringed.” Melynda Price, an associate professor at the University of Kentucky College of Law, proposes the deletion of this right because of the amount of gun violence in the U.S. I like the spirit of this proposal, but would have to evaluate specific language for such a change. Readers are invited to add their comments, and I made the following suggested constitutional changes. 1. Outlaw Senate Filibuster. To require 60% of the Senators to agree in order to do almost anything is outrageous. It should only be 51% for most issues. Earlier I called the filibuster part of the abominable rules of the Senate; another post discussed revisions to the rule; and yet another post talked about additional attacks on the filibuster. 2. Change Weight of Senate Votes. Based on population, each Senator from Wyoming would have 1 vote, for example, but each Senator from California would have 66 votes. This approach would produce a total Senate vote of 1,094 based on the total U.S. population in 2010. The weightings would be changed every 10 years with the new census. 3. Change Term of House Representatives. Change the term from two years to four years to coincide with the presidential election. 4. Direct Election of President and Vice President. I agree with Professor Keyssar that the U.S. should institute direct election of the U.S. President by the national popular vote and abolish the electoral college. 5. Eliminate Life Tenure for Federal Judges. Impose a term limit on all federal judges, including Supreme Court Justices. One solution, perhaps by statute, would be to amend the current statute on judicial retirement (28 U.S.C. § 371) to make such retirement mandatory on reaching the current age and service requirements. I essentially concur in the comments of Professor Greene. Many years ago I made other suggestions for constitutional changes in a virtual constitutional convention. More recently I have discussed what I regard as our antiquated or imbecilic Constitution.